Leonie McDonagh takes her dancers over the top in her Footprints dance. Photo: Brian Farrell. The well-programmed 2014 American Dance Festival performance season comes to a close this weekend with the final performance of Footprints in Reynolds Theater on the 26th. What a year it has been! full of surprises and fresh juxtapositions. I’ll have a few reflections next week, but right now, let me encourage you to follow the tracks and catch the three ADF-commissioned world premieres of the Footprints show. The ADF has many roles. One is to support the creation of new dances, and another is to give the advanced students and young professionals in the ADF School the opportunity to work with choreographers and perform on stage. The Footprints program this year combines these two aspects of the ADF mission with that of presenting important, interesting new work to audiences. We get to see the super-fresh art danced by the fresh and enormously enthusiastic young dancers. I have this theory that it takes about 12-15 years for the zeitgeist of a new century to really take hold. Well, kids, we are definitely not in the 20th century any more. We’ve passed that awkward cusp time when the ashes of the old are raked by all and sundry and may flare into a simulacrum of newness. 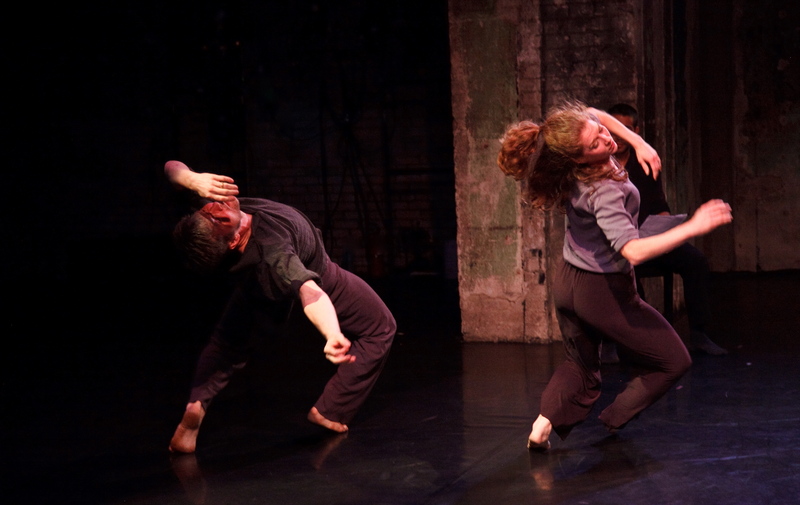 These dances, as different as they are, share the complicated hyper-charged sensibility of NOW. The ideas about simultaneity that so intrigued artists 100 years ago appear thin and simplistic in light of the layering used by these three choreographers. Leonie McDonagh literally piles it on in the hilarious opening sequence of Four Fingers and One Thumb. Netta Yerushalmy runs bands of action across the stage, making stripes of dancers weaving across the stripes of marley floor laid up and down in her Pictogrames. Carl Flink has action boiling out of the shadows in An Unkindness of Ravens, and overtaking other action before being layered over by another. They also share a sophisticated visual sensibility, so that color and light and graphics become key elements of the performance. Rather than single pieces of music, these dances have soundscapes. Recently I was chatting with a friend who was worrying about the decline of audiences for music and theater. I told him people were not going to quit wanting art, but the art would be different. In Footprints, it already is. Thank you for writing this. My 17 year old is in the McDonagh piece and I will see her tomorrow night. I get no info from her so I am forced to google and this popped up. We live in Maine. She has had an amazing 6 weeks.